Air raid sirens were blaring in Tel Aviv recently when two rockets were fired at the city from Gaza, which is governed by Hamas (first link). Air raid shelters were also opened in Tel Aviv due to the attack. Thankfully, both rockets missed their target. One apparently fell harmlessly into the Mediterranean Sea. The first link also states that Israel ‘s Iron Dome air defense system successfully engaged the two rockets, but apparently it was not necessary to fire projectiles at the rockets due to their errant trajectories. 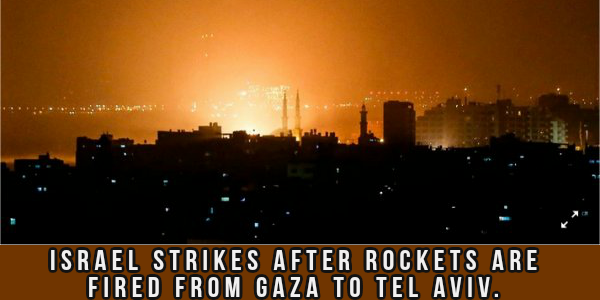 The second link adds another perspective on this rocket attack against Israel and reports that the Israelis have retaliated by hitting terrorist targets in Gaza. However, as this post is being written, it is not yet clear how many targets in Gaza were hit by the Israelis and what effect those strikes had. The sound of an unidentified explosion can be heard in a video clip at the second link. Hamas did not claim responsibility for this rocket attack, but since Hamas has a tight grip on everything that happens in Gaza, it is hard to picture them not knowing about this rocket attack before it occurred. If the Israeli response is limited to a small retaliation, I think many will see it as a rather weak response to a rocket attack against the largest Israeli city. If those rockets had successfully hit large buildings or infrastructure facilities in Tel Aviv and caused human casualties, the Israeli response would likely have been swift and harsh. The nation of Israel faces new elections in a short time and the incumbent Prime Minister, Benjamin Netanyahu, is a target of legal action by Israel’s Attorney General, so these factors may influence Israeli actions at this time. As of this writing, Israel’s reaction has been very minimal, but that could change by the time readers see this post. At any rate, this attack against Tel Aviv highlights that a large Mideast war could erupt at any time due to some provocation that required a major military action as an appropriate response. If those rockets fired from Gaza had hit important targets in Tel Aviv, such a war could be raging now. It is even possible that the rockets fired at Tel Aviv were intended to provoke such a war. In all likelihood, the rockets fired at Tel Aviv were smuggled into Gaza via Iranian connections. I think it is obvious that whoever fired these rockets from Gaza was trying to hit targets in Tel Aviv, not direct them harmlessly into the Mediterranean Sea. This means one of two things. Either these missiles had very bad guidance systems or Israel’s Iron Dome air defense system has a new tool at its disposal. It is well-known that the Iron Dome system can fire projectiles (kinetic interceptors) at incoming rockets or missiles, but the air defense system may now have a way to confuse the guidance systems of incoming missiles so they are misdirected to land at harmless locations. This option, if it exists, would be very valuable as it would “save ammunition” for the Iron Dome’s batteries to fire actual projectiles at only the most threatening or fastest incoming missiles. With Israel being targeted by many tens of thousands of Hezbollah rockets and missiles located in southern Lebanon, the potential for a major war in the region is considerable. Iran has pledged to “wipe Israel off the map” (as several previous posts have documented) and Israel has the capability to hit Iran and its proxies very hard if Iran attempts to do so. Since the rockets fired at Tel Aviv were almost certainly provided by Iran, it is not likely that they were fired at Israel without Iran’s permission. Students of the Bible know that its prophecies foretell that the region of the Mideast and especially the city of Jerusalem will be key flashpoints at the end of our age. Zechariah 12:1-2 prophesied that the city of Jerusalem will be a “cup of trembling” and a “burdensome stone” to the nations of the world in the latter days. In other words, it will be a focal point of contention and strife among a variety of nations. Zephaniah 2:1-10 prophesied approximately 2600 years ago that in the end time of our age, the Jews (“Judah”) would have a nation of their own in the old Promised Land, and this ancient biblical prophecy accurately predicted that the new Jewish nation would include the Mediterranean coastland and the city of Ashkelon at its founding (verse 7). That an ancient biblical prophecy would be so specifically fulfilled in such detail when the nation of Israel was founded in 1948 can only confirm that an immortal Creator God authored the original prophecy and that he directs human events throughout human history to ensure that his prophecies come to pass according to his pre-determined timetable. For additional information on the above topics, please read my free articles, Are We Living in the Biblical Latter Days? and Four Reasons the Jews are Judah.